If you have a passport, you can pretty much travel the world, but if you want to actually LIVE somewhere, your passport can only get you so much time….90 days to be exact if you are in Poland (or one of the other Schengen countries). When David came in January, he applied (in February) and received a temporary resident card (in June). He’s working here, so he’s allowed to stay the length of his job contract. My situation was different because I didn’t come to stay until the end of June and then several things complicated matters. David was told by NATO that the length of stay was 90 days and then if I left the country (went to a non-Schengen country) for a day or two, I could come back and the 90 days would start again. Seemed like a good plan as I was already planning to go back to Virginia in September. Since by September, we knew that David’s contract wasn’t going to be renewed for 2016, I purposely delayed my return until October so that my new “90 days” didn’t expire until January. 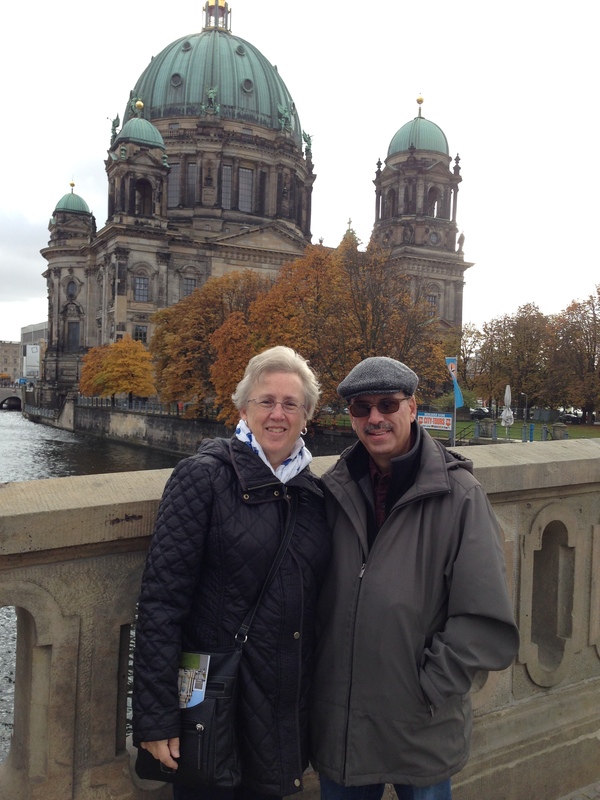 There was an added benefit to this–my sister Jan was able to come back with me for a short vacation. 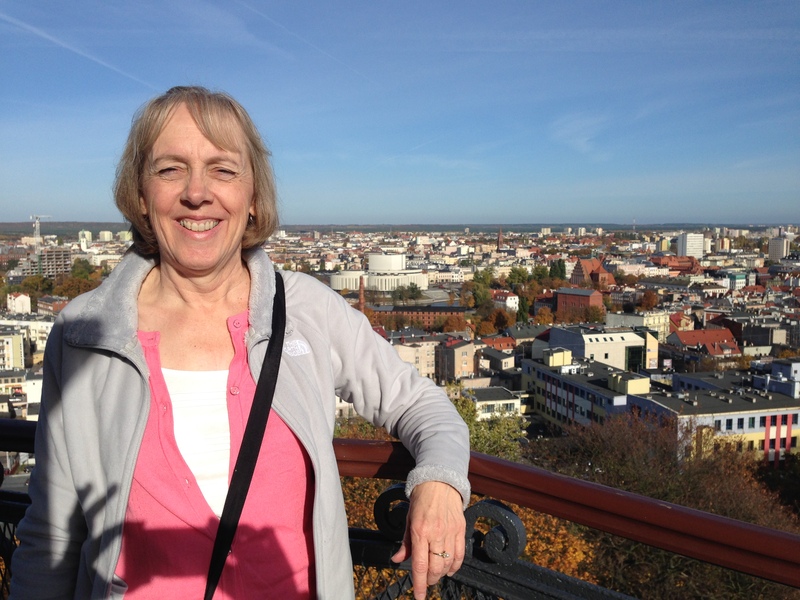 Here she is at the top of the Water Tower enjoying the view of Bydgoszcz. But, then things started to unravel. Turns out the 90 day rule changed almost two years ago. The new rule is that you can stay 90 days within a 6 month period and then you have to wait another 6 months before you can return. So we quickly started counting up the days I had used….oops…only 17 days before I was in the country illegally. After making lots of phone calls to the US Embassy in Warsaw and an attempt to get a temporary resident card in Bydgoszcz for me (not enough time….remember it took David almost 4 months from when he turned in the paperwork to get his). 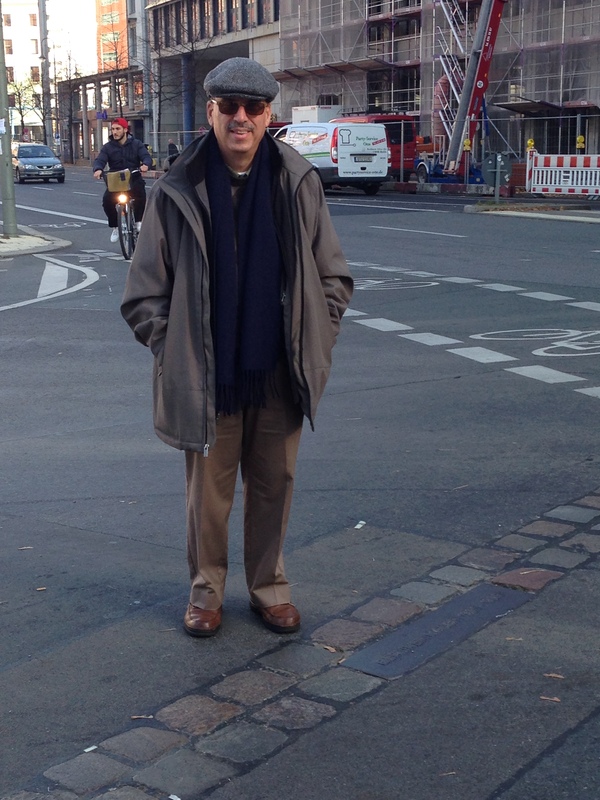 It was off to the Polish Embassy in Berlin, Germany to try and get a Schengen Visa. (If you are wondering why we didn’t just go to Warsaw, it’s because you have to go to an Embassy that is outside of the country where you want to live….and the embassy in Berlin was the closest one to Bydgoszcz. And then we hit another snag….you have to have an appointment…and when we finally figured out how to make one, they didn’t have one for the day we had planned to be in Berlin. 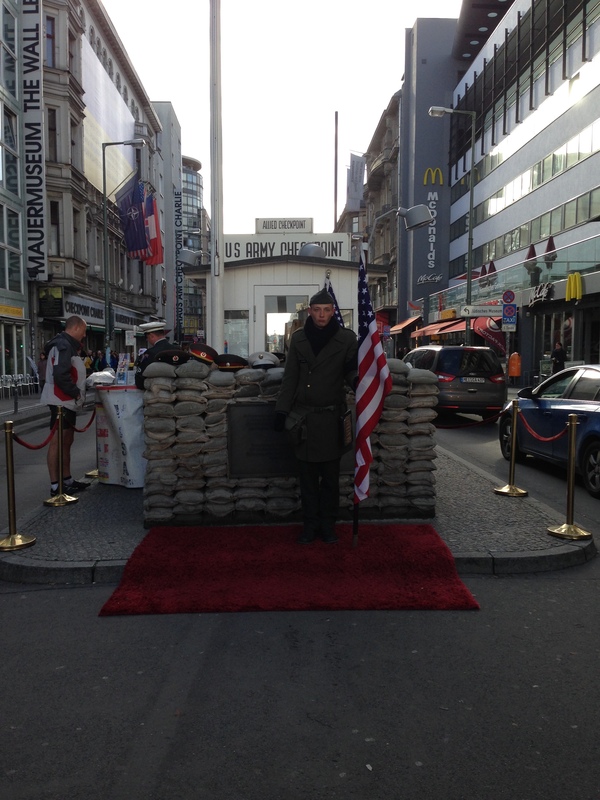 So…since we had already paid for a hotel room, and my sister had never been to Berlin either, off we all went. 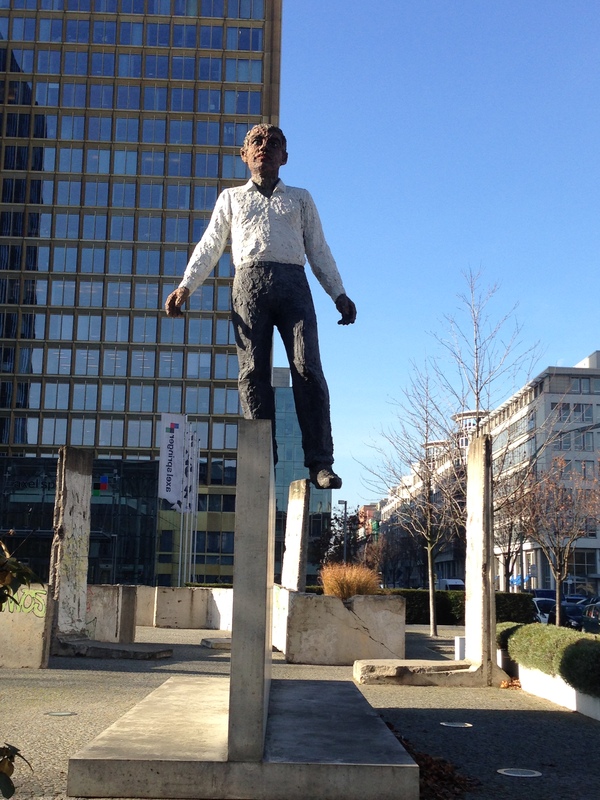 Our hotel was just a block from where the Berlin wall divided the city and we stumbled on this – The Balancing Act. Those are actual pieces of the Berlin Wall. It commemorates the 50th anniversary of the laying of the foundation stone of the Alex Springer Building which was built directly on the border of the Soviet sector of Berlin (the latter course of the Berlin Wall), which became a “lighthouse” for the Free West. 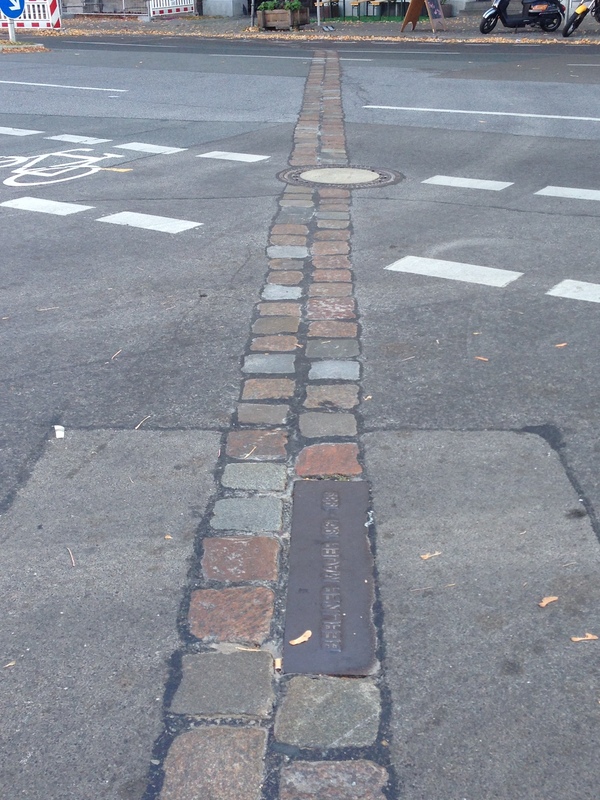 The cobblestone bricks (and bronze plaque) mark the spot where the Berlin Wall once stood. 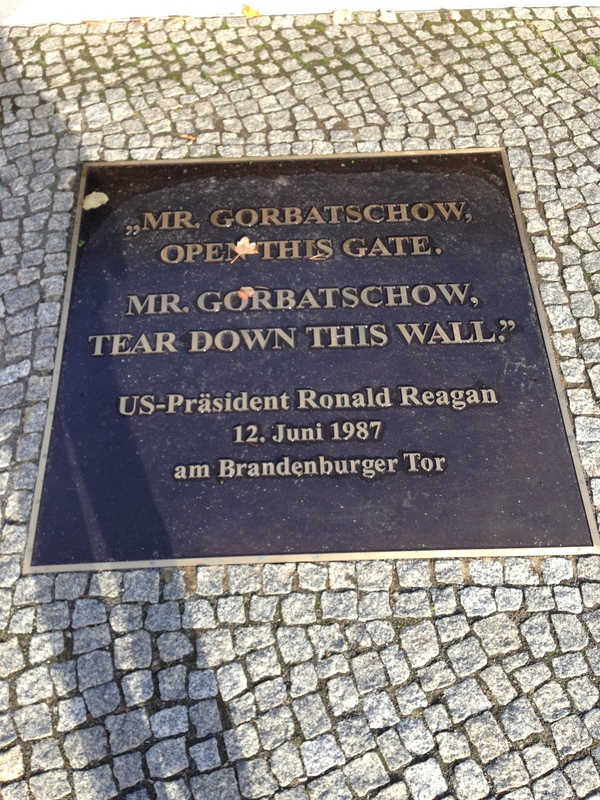 You can see this is in other parts of the city where the wall once stood too. Who was Alex Springer? “ Alex Springer was a publisher who dreamed of a unified Germany. 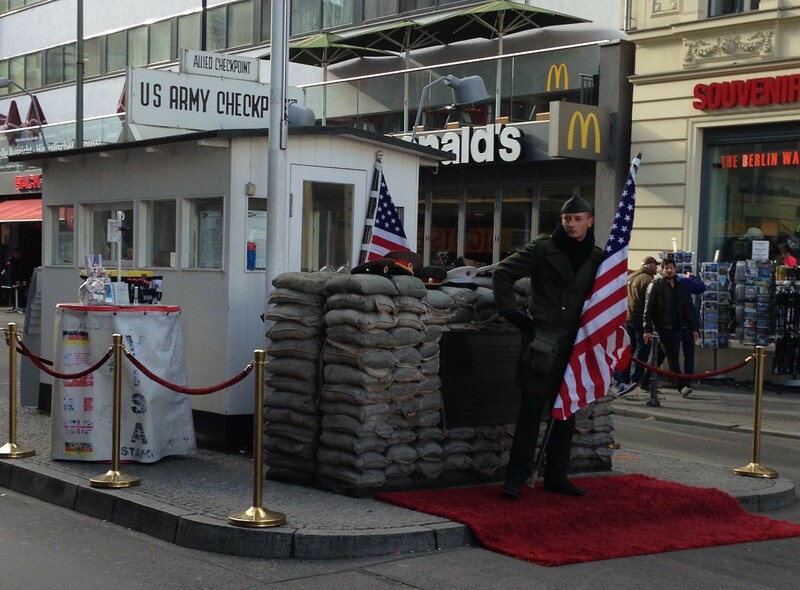 His unwavering commitment to freedom and self-determination for the entire nation played a large part in overcoming the wall.” But we were actually on our way to see “Checkpoint Charlie”. He looks very “official”, but he was hamming it up with all the tourists that were taking his picture. Now, it’s just this what you see above — in the middle of a busy street, but it used to look like this years ago. 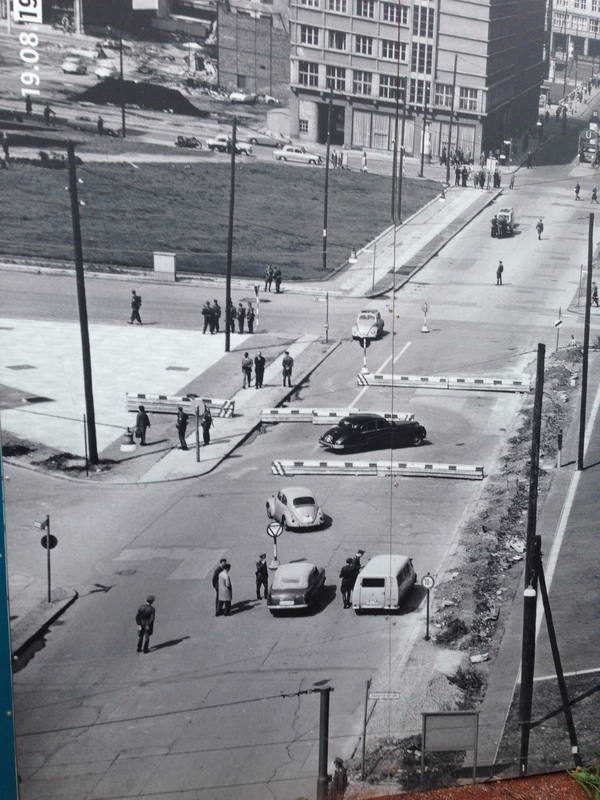 This picture is part of a great exhibit on the opposite corner that you should take the time to see as it has more pictures and displays about all the people who were shot and killed attempting to cross the wall to freedom. 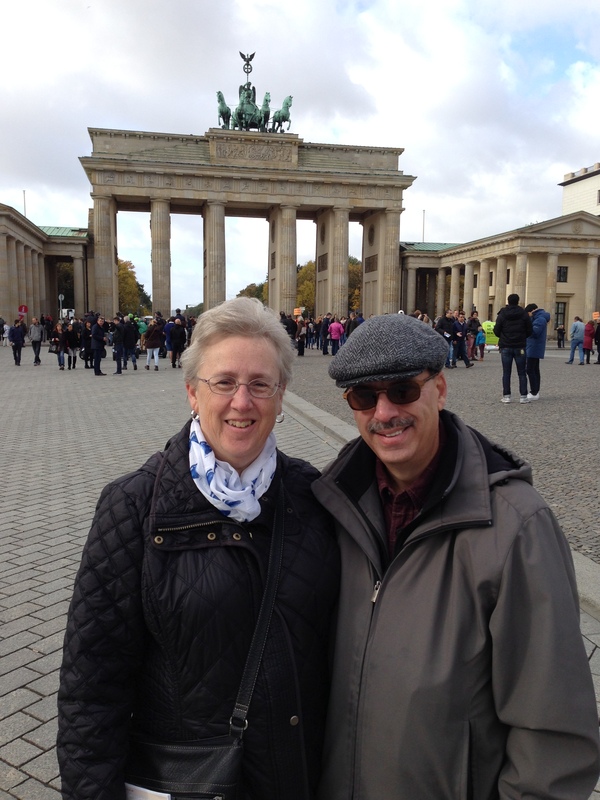 Next stop?….The Brandenburg Gate. But oops …on the way, we walked past this: it’s an exact size replica of the shape and size of the Bohemian Bethlehem Church which stood on this spot from 1737-1963. It was the first Bohemian Church in Berlin and was a gift from King Freidrich Wilhem I to the Bohemian exiles after they had to leave their homeland because of their Protestant faith. It was heavily damaged during the war in 1943 and then demolished by the East Germans in 1963. This replica was built in 2012 and apparently has LED lights and is lit up at night….but it was daytime, so we unfortunately didn’t see that. 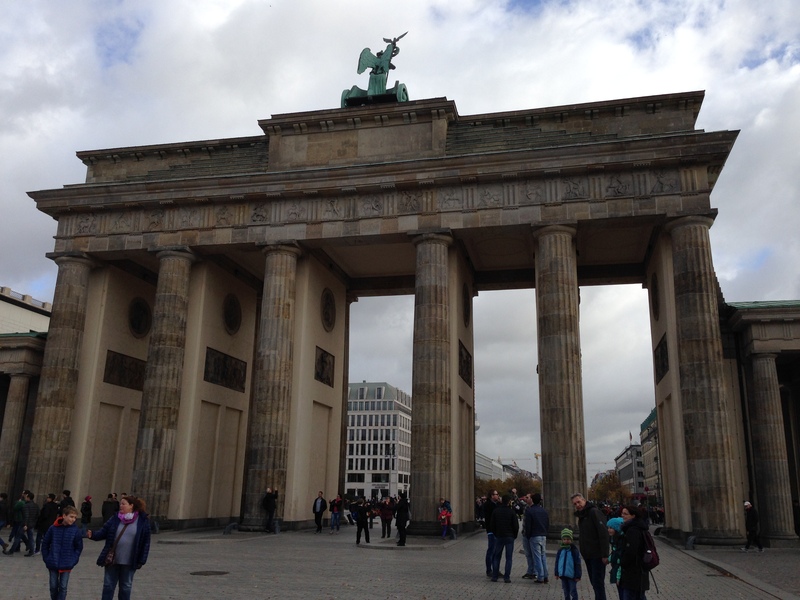 But onward to one of the best known landmarks in the city…Brandenburg Gate. I’d seen pictures before, but it’s much bigger than I thought. Standing 28 meters tall (almost 92 feet), it was constructed as a symbol of peace by Frederick Wilhelm II and completed in 1791. Here’s a fun fact for you: Only the royal family was allowed to walk through the central arch of the gate. Everyone else had to walk through the other arches. Since we aren’t royalty, when we walked through we went by the side arches. 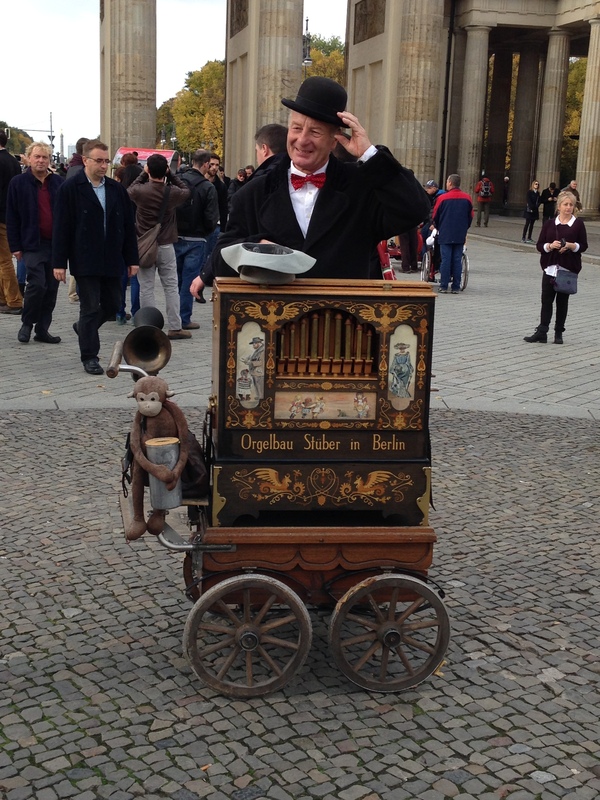 How about a little street entertainment while you look? 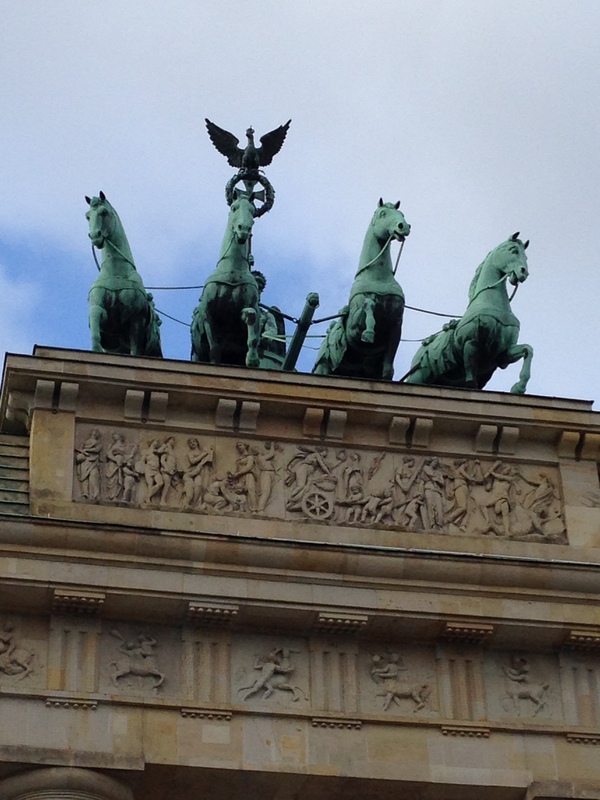 There are horses on top — a Quadriga, a chariot drawn by four horses. 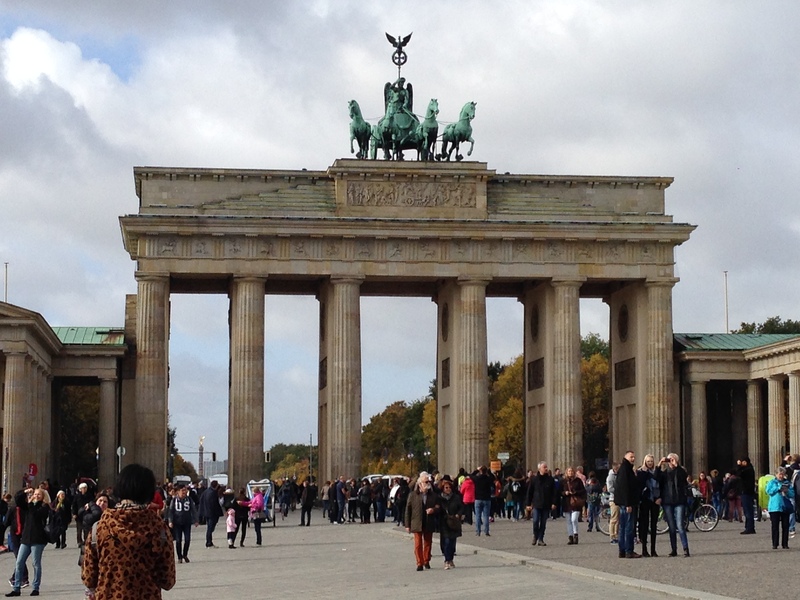 There is a fun fact about that too — the Quadriga was stolen by Napoleon in 1806! The famous chariot guided by four horses was kept in Paris until it was returned to Berlin upon his defeat in 1814. What I want to know is how do you get that down to steal it?? and this is the view from the other side. 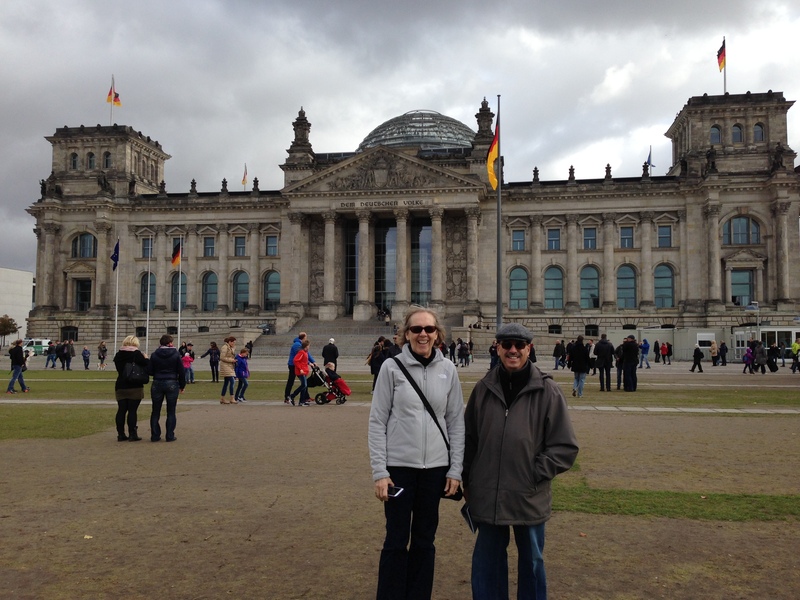 About a block away is the Reichstag Building, so we made our way over. It was opened in 1894 and it housed the German Parliament (Reichstag) until 1933 when it was severely damaged by fire. It went unused for years and then was partially refurbished in 1960, but it wasn’t until October of 1990, after the reunification of Germany before major renovations were made and it once again began being used by the Bundestag, the now German governing body that replaced the Reichstag. 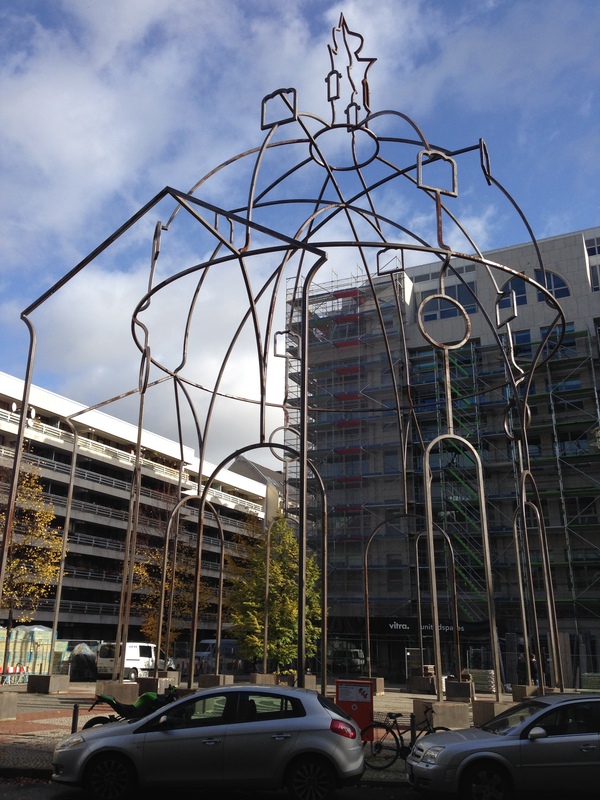 Our daughter Maria has been here and told us that this is one of the “must see” places in Berlin. There are free tours, and you can go inside the dome (it’s glass) and get fantastic views of the city. But the wait in line just to get an entry ticket was over 2 hours long. Since our time was limited, we decided to maybe try the Berlin Tower instead so we headed that direction. 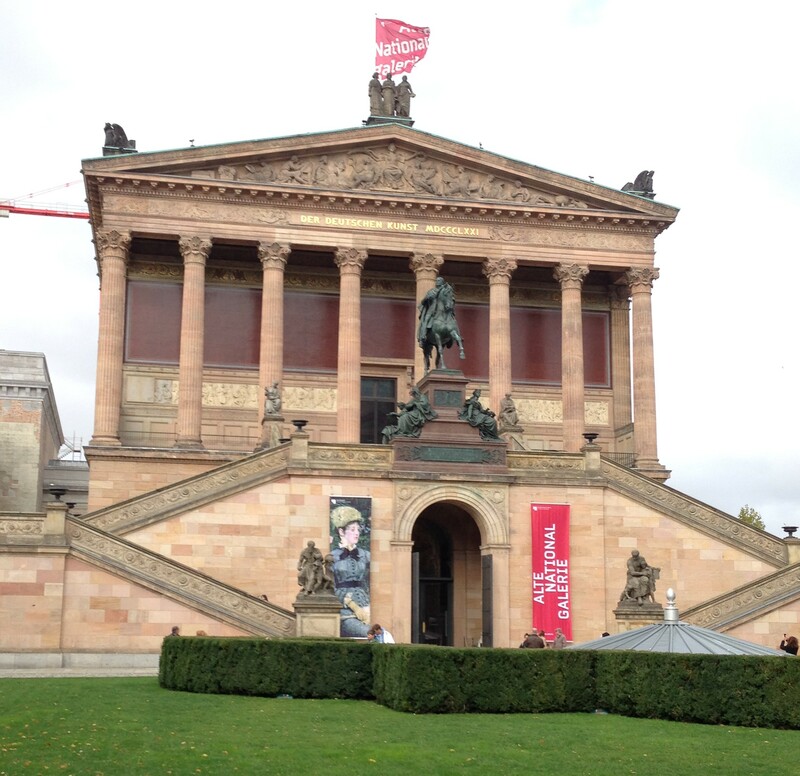 Along the way we passed this impressive building – the Alte Nationalgalerie, one of five buildings scattered throughout the city that are part of the Berlin National Gallery. 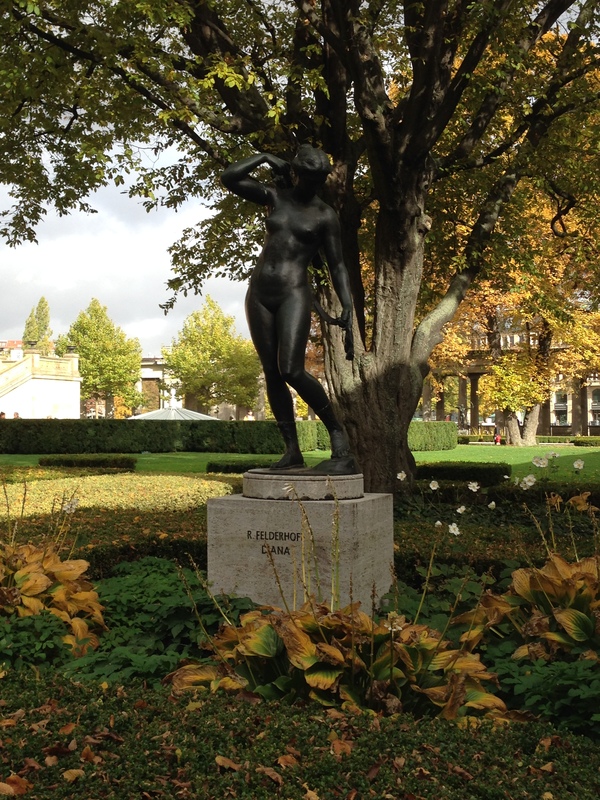 And this statue….yep, another Naked Lady…well, it is art. It’s actually a bronze sculpture of Diana, Roman goddess of the hunt by German sculptor, Reinhold Felderhoff. Completed in 1898, it was displayed at the 1900 World Exhibition in Paris and later became part of the collection of the National Gallery in Berlin — which explains why it is in the garden outside that building. 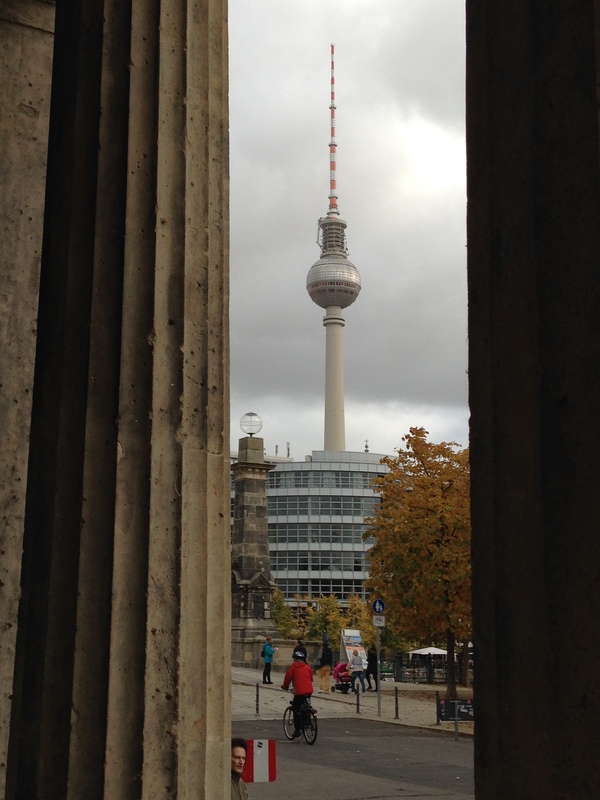 You can see the Berlin Tower from here. We still had a long way to walk to get to it. 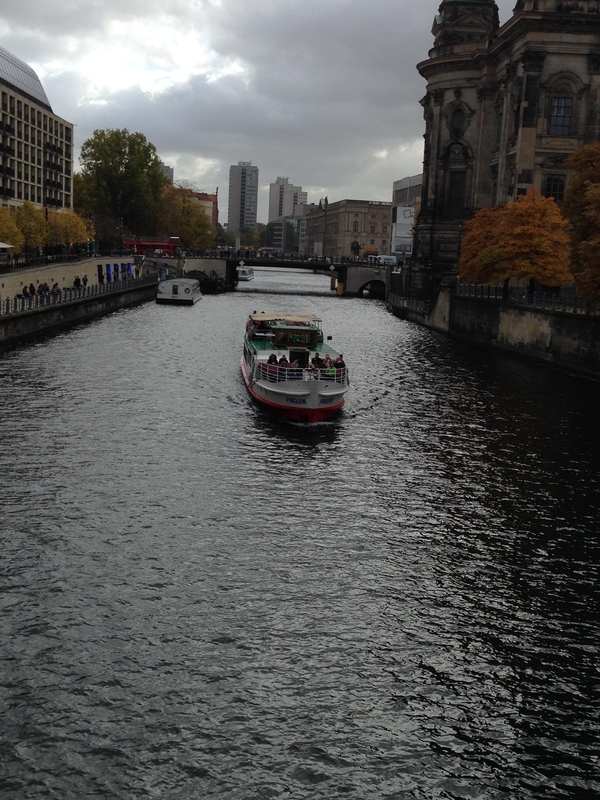 We walked further and stopped to take some pictures as we crossed the Spree river. And saw this and thought it would make a good backdrop. When I was taking this picture of my sister, I noticed that there were people on a walkway just below where the green part of the large dome meets the rest of the building. 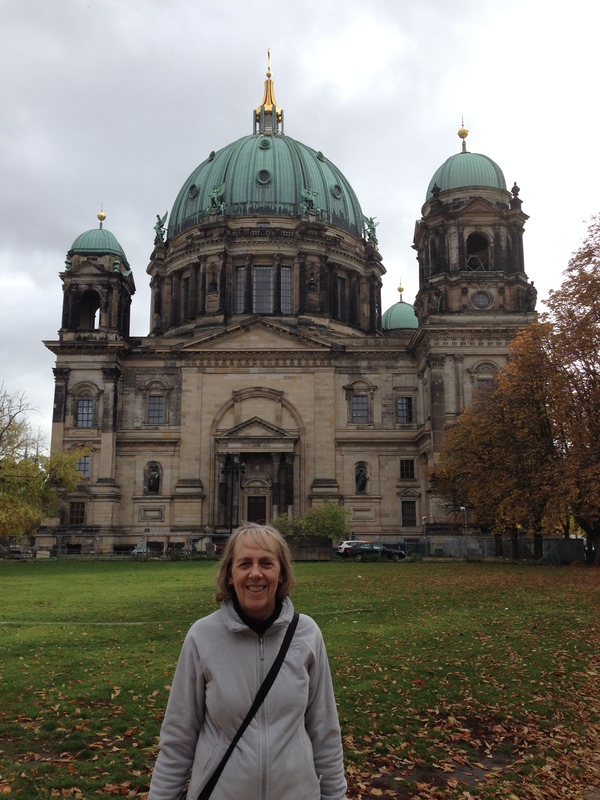 By this time, I was tired (we’d been walking for hours), my ankle was hurting and walking to the Berlin Tower seemed a bit daunting…so we decided to see what this building was instead…which turned out to be —The Berliner Dom (The Berlin Cathedral). This is just the view of the side….the front is even more impressive, but you’ll have to check back for another post as it’s too beautiful for just one picture! Nice! I would love to have a little cooler weather here.